Does your family suffer from sensitive skin or eczema? Try these tips for living with eczema and sensitive skin more comfortably. Half of my family has very sensitive skin and the other half has eczema. We each get flareups in different parts of our bodies, ranging from arms, hands, torso and face. We are usually most at risk for flareups when the weather is either very hot or very cold. Though we haven’t been able to completely avoid flareups, I have found ways to reduce the discomfort and symptoms so we are “Free To Be”. I want to share these tips so you can do the same. Tip #1 – The first way is to live more comfortably with eczema is to avoid scents and dyes from coming in contact with your skin. Use a detergent that is free of fragrance and dyes. 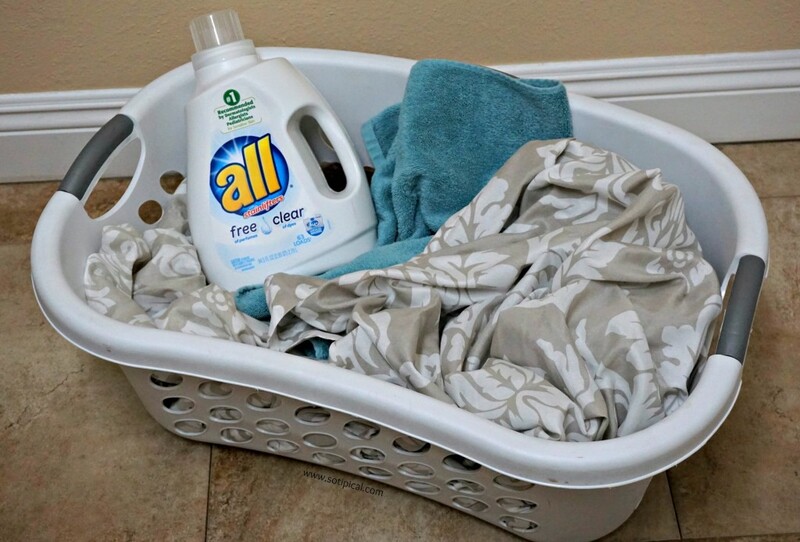 I have been using all® free clear detergent for many years. It is the #1 detergent recommended by Dermatologists, Allergists, and Pediatricians for Sensitive Skin. It still fights tough stains, whitens whites, and brightens colors, without irritating your skin. In addition, all® free clear detergent was awarded the Seal of Acceptance by the National Eczema Association for having no dyes, perfumes, certain chemicals, and irritating residues. Don’t just use it to clean your clothing, but clean your sheets, bath towels, dish towels, blankets and sheets with it too. 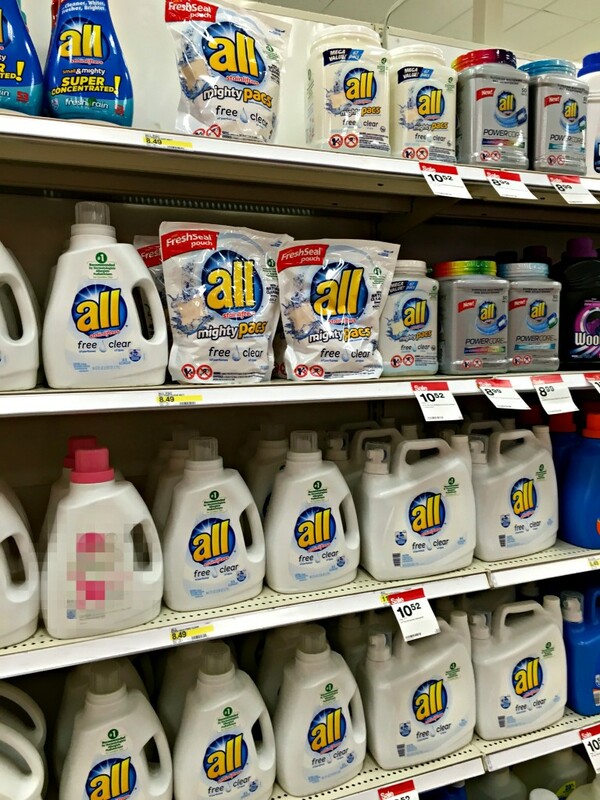 I buy all® free clear detergent at Target, which can be found in the household section. I also keep all® free clear Mighty Pacs® on hand. My husband prefers using them over the liquid, for convenience. Be sure to see packaging for directions and follow them exactly! Tip #2 – Carefully consider your clothing options. We find 100% cotton fabrics to be our best option. Wool, polyester and acrylic are just a few types of fabric that can irritate skin. Always check inside seams when purchasing clothing and skip the pieces that have rough stitching. Select cotton sheets and towels as well. When my daughter was little, she occasionally woke up itching from her favorite character pajamas. I would have to give her a quick bath, then dress her in a long cotton t-shirt. We keep a collection of oversized cotton t-shirts for night dressing. It is a must if you have sensitivity on your torso. Tip #3 – Stay well hydrated, especially when exercising. Always drink plenty of water before, during and after your activity. My daughters are dancers. As with any physical activity, one is likely to sweat. Dance leotards and tights absorb the moisture which can further irritate a flareup. As I mentioned above, clothing can make a big difference. 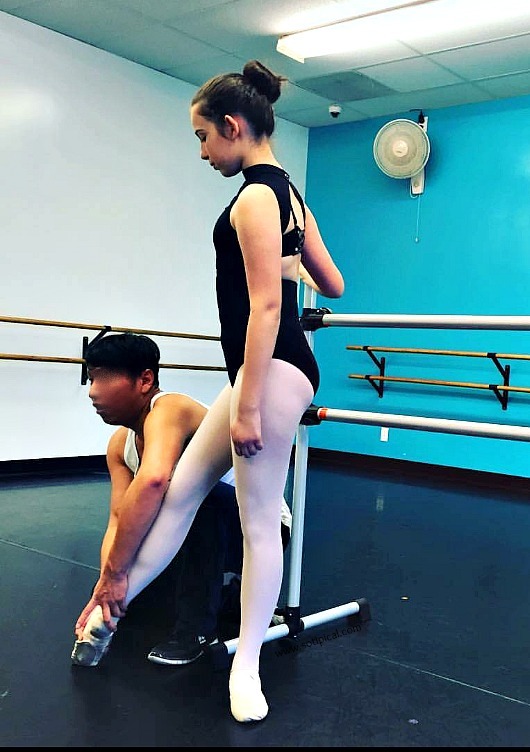 We don’t have many options for dance wear so my girls take breaks and will wash up in between classes, to remove excess sweat from their skin. Something to be aware of – most athletic clothing is made of a synthetic wicking fabric, designed to pull moisture away from skin. If you are living with eczema or sensitive skin, then this may not help you. When the moisture and salt from your perspiration dries into this fabric, it may begin to feel rough to the touch and irritating against sensitive skin. 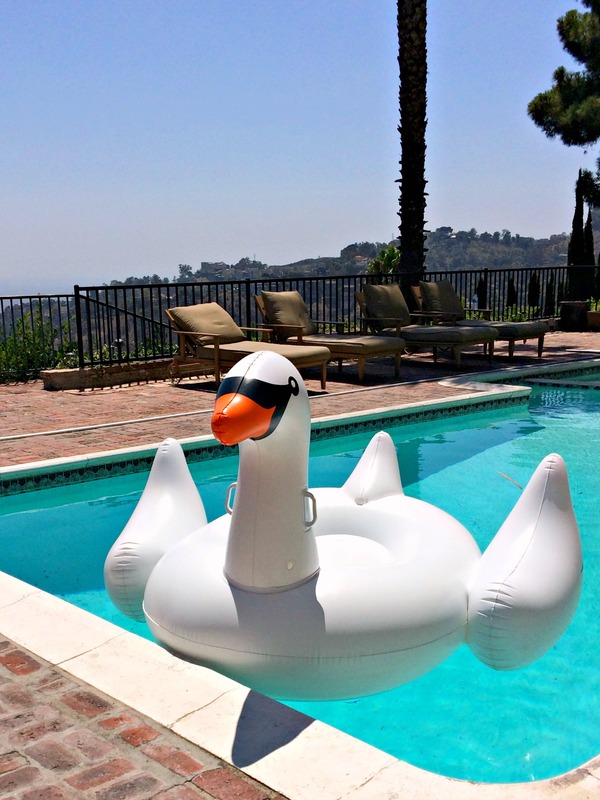 Tip #4 – Swimming can further irritate an eczema flareup or sensitive skin. Chlorine dries the skin so be sure to shower off right after swimming in the pool. Be sure to moisturize very well afterwards. 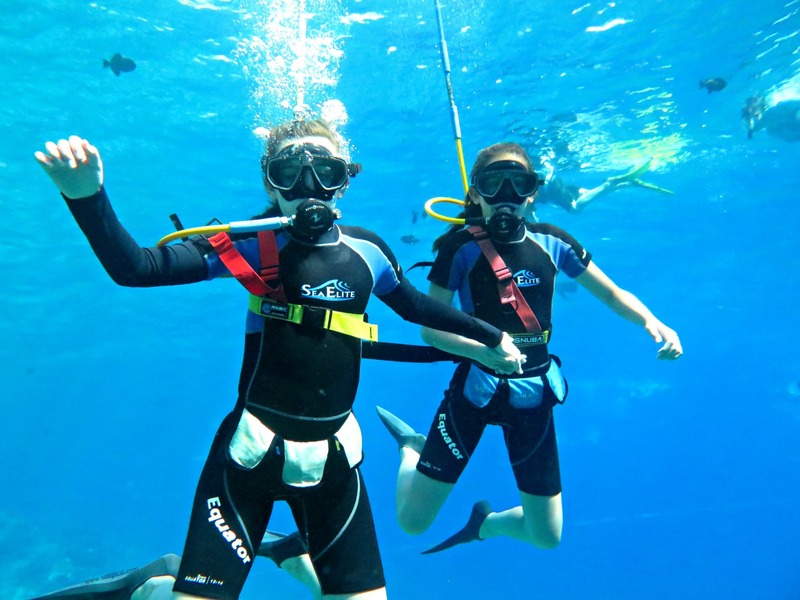 Take frequent breaks when you are swimming and get out of the pool. Our doctor told us long ago that staying submerged in water was very drying to the skin and could further aggravate our eczema symptoms. There is controversy over whether or not ocean water helps with symptoms of eczema. Some say it does wonders and others will tell you that it burns like pouring salt over an open wound. Either way, it is a good idea to shower off the salty residue on your skin after swimming in the ocean. Dry off if you can. Sitting for a prolonged period of time in wet clothing can be an irritant. Tip #5 – When bathing or showering, avoid using very hot water. Hot water can strip your skin of natural oils which can in turn make it drier. Take lukewarm showers and try to be out in 10 minutes. Again, moisturize afterwards! Tip #6 – Try not to use body soap with fragrance. We’re all tempted to get some fruity body wash from the mall, but a natural soap is going to be your best bet. Our favorites include goat’s milk soap, oatmeal soap or dead sea mud soap. They are mild, leave your skin feeling clean, but not dry, and last a fairly long time. Tip #7 – Use coconut oil! We use coconut oil on dry hands and on dry patches on our faces. Coconut oil has antibacterial, anti-fungal, antioxidant and antimicrobial properties that can help soothe your skin when it’s itchy. One of my kids used to play handball at recess all the time. Her hands were so dry, flaky and cracked in the area where she would hit the ball. We would apply coconut oil to her hands and put mitts on overnight to help soften her skin. 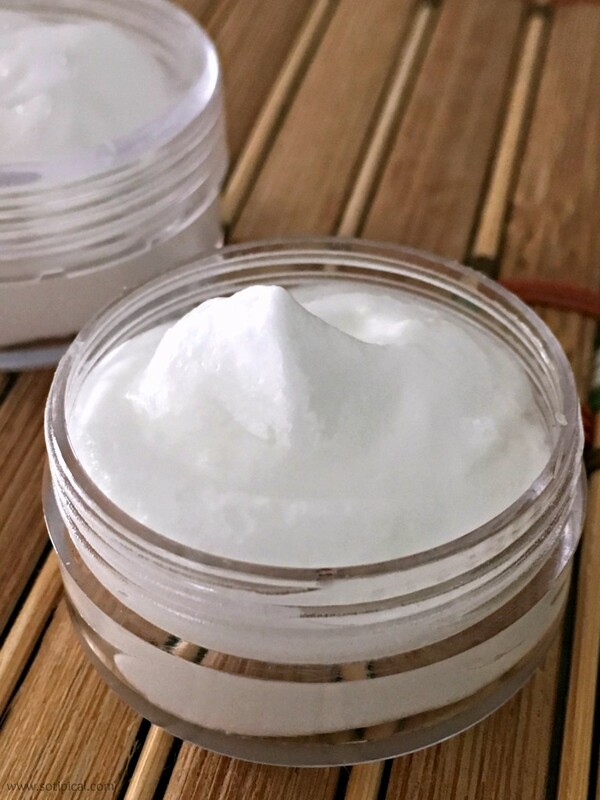 I also make a whipped body lotion to help with dry skin. Its contains coconut oil and shea butter. Shea butter helps to lock in moisture! We love it! 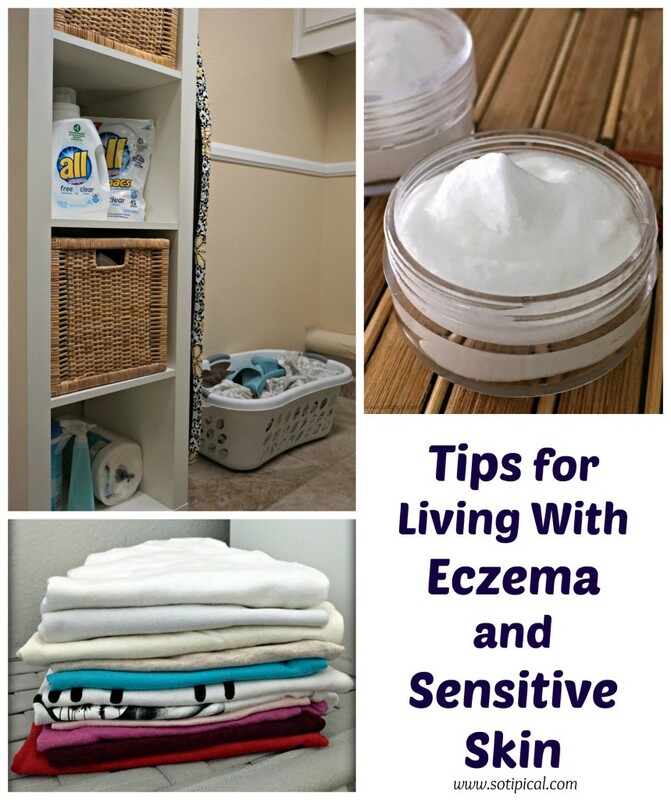 I hope you have found these tips for living with eczema and sensitive skin helpful! Are there any additional tips you have to share? Please leave them in the comments! Also, head on over to check out the all® free clear connection and Accept the Welcome Mission for an entry to win a year of all® free clear and be #FreeToBe !!! Great tips! Our youngest has very sensitive skin and we’ve been using All Free & Clear since she was born. I just started using the pacs recently too. We swear by All at our house! My husband has extremely sensitive skin, so we started using it for him. When we got our Labrador, we found out she suffers from atopy (allergic to her environment), so washing all her toys, bedding, blankets, etc. in All is a must as well. We also wash everything in all® free clear, including the pet bedding! Funny I was just talking about eczema to a client yesterday. I realized I hadn’t had a flare since turning vegan in July 2013! I knew dairy could be a trigger but figured I was vegetarian and that was ‘enough’. I went vegan for ethical issues and only just realized yesterday that it basically cured my eczema! Thats interesting! I’ve been thinking that we should take a closer look at her food intake. I love this detergent and use it quite often. My son and I have skin problems and sensitive skin. These are great tips. My son has been suffering from eczema for years. He also uses coconut oil. I should try that detergent. Coconut oil is a godsend it does everything and I agree some materials tend to irritate my skin because its sensitive. I didn’t know about swimming though although I normally swim in the sea. My son suffers from Eczema and sometimes nothing helps. I haven’t given this a try yet! I need to change something before Winter again. I love these tips, eczema can be so hard to live with! I love All Free it does such an amazing job on cleaning clothes. great tips. My niece suffers from Eczema and these will help a lot. Great tips for sensitive skin. We always go for Free & Clear. My hubby accidentally bought something scented once and I could tell immediately when I put on one of my shirts. I couldn’t wear it again until I washed it in Free & Clear. These are great tips! My son has eczema so I will be trying these once it flares up this winter again. Eczema can be horribly painful. My sister has it and her hands will crack and bleed. Using coconut oil helps, but when you are a mom your hands are always in water cleaning something. Sensitive skin is something that I do not mess around with. That All detergent is perfect for making sure that there is no irritation.